A rustic garden wedding theme is a popular trend in 2017. Despite many of us falling in love with this California countryside theme, most would not imagine being able to find a venue for that setting in a busy city like Singapore. Fret not, as we just discovered a venue that would bring your dream countryside wedding to live. Nestled away in Dempsey Hill, housed in over 35,000 square feet of land and surrounded by lush greenery is Open Farm Community. But the quaint and peaceful surroundings is not the only special thing about this restaurant. With a focus on sustainable local farming, balanced living, and creative dishes, Open Farm Community presents a unique wedding and dining experience for you and your guests. Read on to find out how they can make your rustic countryside wedding come true. One of the reasons why a countryside wedding is a popular choice among brides is because of its peaceful and relaxed ambiance. This setting is perfect for couples who want to spend quality time with family members during their wedding celebration, as guests will feel very comfortable and at home. Surrounded by natural greenery and tucked away from the hustle and bustle of the city, Open Farm Community is indeed a gem for those who want that peaceful garden atmosphere. When it comes to a rustic wedding, it’s all about the furniture, ambiance, and decorations. You want to achieve the ‘barn’ like effect to create the cozy ambiance, but at the same time, be careful to not cross the line to looking old and run down. Open Farm Community’s interiors present the perfect balance of rustic and chic. You get wooden paneled floors, rustic Scandinavian furnishings, and tall paneled windows that let in a soft natural lighting. The warm fairy lights hanging from the ceiling also add a touch of glam to your wedding celebration.Open Farm Community’s design has it all set for you. The indoor area can host 70 seated guests. The most memorable part of your wedding day would be your walk down the aisle and saying “I Do”. 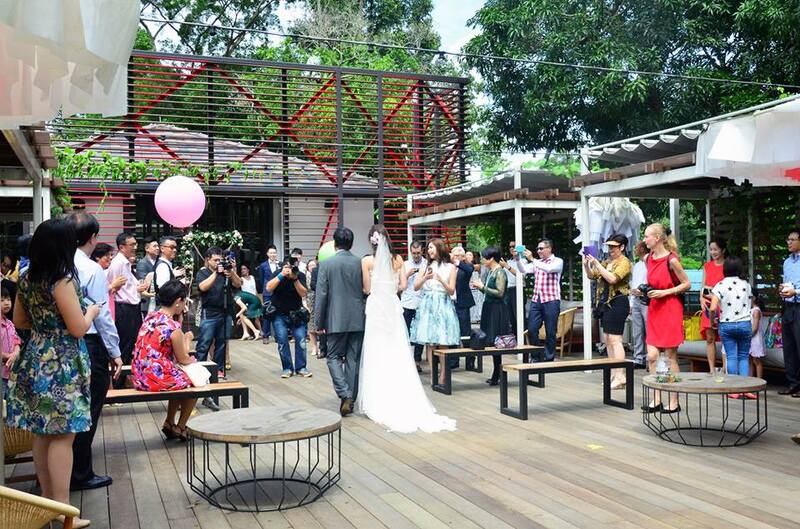 At Open Farm Community, you can have your solemnization at the Café Terrace, where you’ll be surrounded by your loved ones, beautiful greenery and a stunning evening sunset. This space holds up to 80 standing guests (38 seated) and would make a perfect al-fresco setting for cocktails and canapés. Apart from the intimate setting, Open Farm Community presents a unique dining experience with their open concept kitchen, where you can see chefs whip up your food live! This visual experience is incredible and definitely a bonus treat to the eyes. Open Farm Community was created to spearhead local farming, to connect the community to nature and celebrate culinary creativity. This first of a kind dining experience comes together under one roof here and has garnered the interest of many since it has opened its doors. Staying rooted in their vision, the ingredients used in Open Farm Community’s well-crafted menu is from local farmers. The team also incorporates many home-grown ingredients. Be sure to check out their Roasted Red Snapper, which incorporates their home-grown Roselle and hibiscus. This lightly seasoned fish complemented by zesty Roselle and hibiscus ketchup is bound to create an explosion of flavours in your mouth. Another dish that caught our taste buds was the Banana Pandan custard. Apart from the beautiful plating, this dessert presents a refreshing combination of lemongrass sago and fragrant pandan, which makes an exquisite treat. 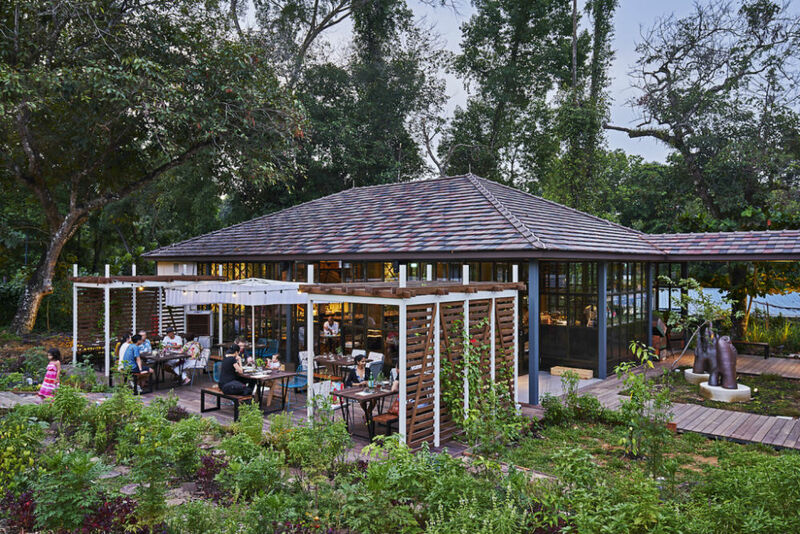 Open Farm Community’s well-crafted menu doesn’t stop at good food. It also extends to a unique selection of cocktails that are garden grown. Meticulously crafted with their homegrown herbs and fruits, it doesn’t get any fresher than this. 7. A joyous evening to remember – fun games anyone? Great memories are captured by the things you do and the people you do it with. The outdoor deck of Open Farm Community presents you a spacious deck for performances or even games and activities! The soft sofas along the deck are great for chilling out and just spending the lovely day together with your favourite people in the world. Click here to book your wedding at Open Farm Community today! Planning for your wedding? Read our wedding guide here that will help your planning. For your honeymoon, read our honeymoon guide here. If you need any help/services, email us at [email protected]. We’d be happy to help! This post was brought to you by Open Farm Community. Want us to review your property? Email us at [email protected] for details. For advertising, please email [email protected]. Click here for more information.